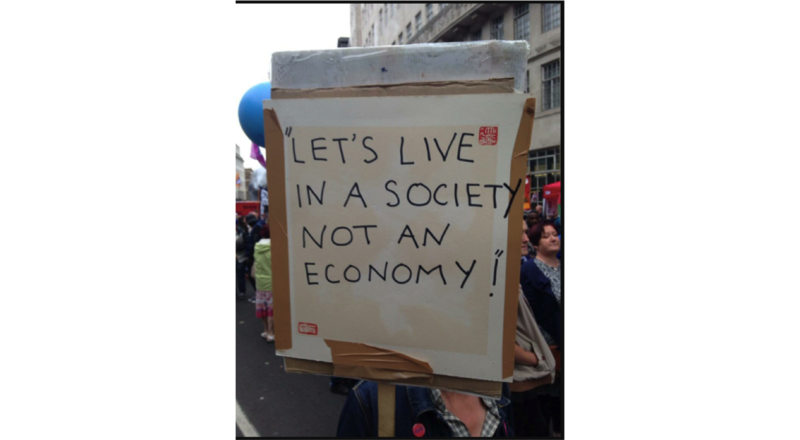 The placard above was photographed at a demonstration in London last week and quickly went viral as a pithy rejoinder to neo-liberal economic policies and the gradual erosion of the social around the world. I had an experience in Ahmedabad which, in my eyes, complicated both the student’s understanding of the issue and the aspiration at large. Although I am of course devilishly handsome and effortlessly charming, I am ever so slightly vertically challenged. This often means that I need to get trousers shortened because the average British man’s legs are freakishly long. In the UK this can often mean I pay as much for alterations as I do for the trousers themselves, such is the cost of labour. In India, this is a different story and so I bring newly bought trousers here to be altered. Outside the IIM-A campus I found a small, poorly lit and slightly dingy tailor shop. As with most such shops, there were three staff, all older men at various stages of decrepitude, with one hunched over a dated sewing machine and the other two sat on chairs and looking blankly out in the street. I explained to the one active tailor that I wanted each pair of trousers shortened by 3 inches, and he took one away to show me what that would look like before we agreed on a length for them all. He cut and stitched with surprising speed and within 3 minutes showed it to me. I agreed this was and fine and I asked him how much a batch job would cost. At this point he puffed out his cheeks and fixed with me a gaze, as though he was about to break bad news. In Gujarati he told he it was going to be expensive but we would do a first rate job, and that’s why it would more than he might ordinarily charge. I had no idea how much it might cost – in the UK, it would set me back around £15 per pair of trousers, but I’ve had trousers altered in Bombay for Rs 500, so I was expecting something like Rs1000 for the six trousers. Almost apologetically, he said it would cost me Rs 150. I thought I had misheard, so I asked him again. He took this to mean I thought it was exorbitant, and again made the point that the work would be impeccable. There may well be a case, as friends pointed out, that I was being overcharged here. That might be true. But to me, the value of the work being done was far in excess of Rs 150. I would have gladly party with 10 times that amount, and given the tailor’s experience and skill level (which I had witnessed) I felt massive guilt in what I considered to be an underpayment. If this was a purely economic transaction this would arguably be a win-win situation: the price of the work was lower than I expected but higher than the tailor would usually charge. If I saw this as a social interaction, however, is it morally incumbent on me to pay what I feel the work is worth, following the imperatives of the giving economy? If I were to do so, however, would this be perceived as a condescending “pity payment”? Moreover, would it distort his own understanding of his pricing and market value? I, in a position of affluence and therefore privilege, have the liberty to render this economic transaction as a social negotiation and suffer no ill-effects. On the contrary, I might feel myself more fully human through this act of largesse. The tailor, by contrast, has no such liberty: for him he can only ever be the beneficiary of my socialized choices, and might even have his humanity diminished as I strive to redeem my own. In an ideal world it would be easy to substitute economic for social reasoning. In the world we live in, it is fraught with consequences beyond our understanding, especially for those at the receiving end of our idealism. We’d all choose to live in an economy rather than a society, but, as with so many things, this is a choice that is easier for the rich than for the poor.